One Great George Street was again the venue for the 2018 IDE Autumn Seminar. 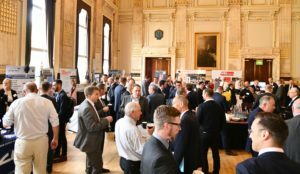 The stunning location, home to the Institute of Civil Engineers welcomed a packed house for a day of industry talks. Hosting his final Seminar, IDE President David Darsey welcomed everyone before delivering news that two long-standing Members of the Council Of Management were stepping aside at the forthcoming AGM. Both Mick Ulyatt and Adrian McLean were thanked for their hard work and dedication to the Institute and their presence will be missed immensely. Mr Darsey went on to congratulate and thank all of the IDE Members for their help and assistance in raising funds for his chosen charity, Niemann Pick UK to the tune of £20,000. The first speaker of the day was Paul Delderfield one of only four Specialist Inspector of Health and Safety for the HSE. Mr Delderfield is responsible for looking after issues of noise and vibration and spoke at length about the issues facing contractors on monitoring HAVS (Hand Arm Vibration Syndrome) within the industry. Next to take to the stage was Swantest’s Conor McHugh a civil engineer with vast experience in construction and demolition projects. Mr McHugh delivered a talk on load testing of various floor types to allow contractors to design specific methods of floor by floor demolition works. Mr McHugh spoke about Swantest’s capabilities in delivering accurate test results for different materials and designs of structure and the ability to safely test the strain and deflection of a floor giving the demolition contractor a true and accurate figure instead of relying on potentially incorrect drawings and specifications. The final speaker for the early shift was ABB’s Stephen Andrew who offered the packed auditorium a detailed analysis on how to increase safety and reduce potential costs on demolition projects through properly managing risk. “Removing the myth that many clients think that demolition is just construction in reverse would be a great start.” Mr Andrew explained “Along with removing the clause that the contractor accepts all risk on a project would be an even better outcome.” Rounding off, Mr Andrew explained that the ideal solution to a demolition contract would be that when signing off designs for a particular building, they took into consideration its future demolition. The late morning presentations were commenced with an interesting talk on the World War Two defences erected along the south coast of England. 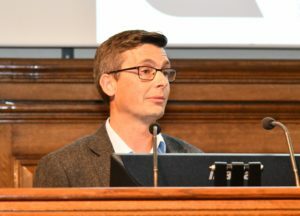 Mark Harrison of Historic England described his and his team’s task to track down and identify buildings built to defend the UK from Hilter’s potential invasion. 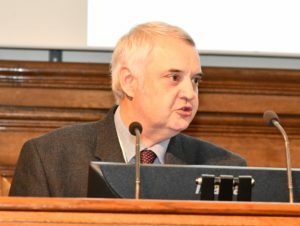 Mr Harrison spoke about the construction and subsequent demolition of many of the wartime structures which led to the financial ruin of a number of contractors under-estimating the demolition works. AR Demolition’s Richard Dolman completed the morning’s presentations with an interesting talk on the demolition of the Broadmarsh car park in Nottingham city centre. The congested and difficult location forced Mr Dolman’s team to look at alternative methods of demolition due to the location of the project which was surrounded by various bridges, subways and busy roads as well as having a number of properties remaining live within the building as it was to be demolished. The technicalities of demolishing the structure involved the AR Demolition team commissioning and using a mobile hoarding system to ensure debris remained within the site and the use of a bespoke tele-handler mounted dust suppression system which enabled the site team to complete the project without a single complaint of dust from the surrounding businesses or public. Following on from lunch the first speakers to take the stage were Jim O’Sullivan and David Rowe from Keltbray. Their topic was a continuation of a previous IDE Seminar discussion, the demolition of Earls Court in London. Following on from the previous presentation on the project both Mr O’Sullivan went into detail about one of the most complex portions of the redevelopment of the site, the removal of over 60 large concrete beams which spanned at various locations, the numerous London Underground tunnels bisecting the site. The largest of these beams, nicknamed Big Bertha was almost 40m in length and weighed in excess of 1400 tonnes and the initial thought of the demolition team was to cut each beam into chunks of approximately 20 tonnes before removing them with a small crane. This idea was shelved due to the projected 3-year duration of the work and instead Keltbray contracted ALE and the world’s largest crane to lift the beams out whole. From the detailed preparation on the ground to the dealings with train operators, the introduction of the crane shaved almost two thirds of the previous methods time away. Although not revealing the cost of hiring the crane, the Keltbray duo were very open and honest in their extremely interesting presentation which was very well received by the packed afternoon auditorium. Noise, vibration and dust monitoring was the topic from the next speaker, Campbell Associates’ John Campbell. The issues associated with accurate monitoring and recording of these issues associated with almost every demolition project were highlighted by Mr Campbell who described the methodology and technology behind the gathering and recording of this information. One area of particular interest being highlighted was that of ensuring background checks are undertaken and recorded prior to works commencing on site. 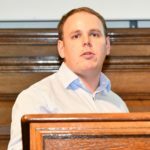 The day’s final speaker was Andun’s Angus Holdsworth who gave a presentation on the delivery of two complicated rail projects in London at Manor Park and Highbury Corner. Talking about the problems encountered working in an extremely tight location at Manor Park, Mr Holdsworth spoke about the difficulties of stationing a 500t capacity crane close to a retaining wall in order to lift sections of overhead walkways situated directly above the electrified lines used to power the trains. The second project involved the demolition of the bridge which carries the A1 over the London Underground line at Highbury Corner. The bridge, constructed in the 1850s was of poor condition when the team commenced work on the delicate job to remove it. Rounding off the day, David Darsey thanked everyone for their attendance and reminded them of their need to vote in the upcoming IDE elections, the results of which will be announced at the forthcoming AGM and Luncheon to be held at Draper’s Hall, London on the 16th of November. Author and Photography courtesy of Paul Argent, RPA Photography.